Meditation Makes You More Creative! ARE YOU BRAINDEAD, TRAINEE?! I’m going to make innovators out of you! Drop down, sit with your legs crossed and do some MEDITATION! A recent study, has shown that certain meditation techniques can promote creative thinking. The study, conducted by cognitive psychologist Lorenza Colzato at Leiden University, clearly demonstrates that meditation is not only for relaxation but can have long-lasting effect on human cognition including the much coveted creativity that every innovator should care about. I could also drop names from the likes of Steve Jobs (who encouraged Apple’s employees to learn meditation to “boost their creativity“) or Oprah Winfrey (who practices Transcendental Meditation) or David Lynch (who started meditation in 1973, and says “It has given me effortless access to unlimited reserves of energy and creativity“), but I will let the study speak for itself. Convergent thinking, on the other hand, is a process whereby one possible solution for a particular problem is generated. This method is measured using the Remote Associates Task method, where three unrelated words are presented to the participants, words such as ‘time’, ‘hair’ and ‘stretch’. The participants are then asked to identify the common link: in this case, ‘long’. 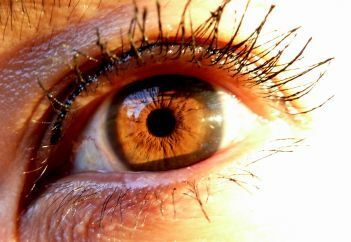 In Focused Attention meditation the individual focuses on a particular thought or object.Unfortunately, this technique had no significant effect on convergent thinking leading to resolving a problem. If you are not convinced by this single study, there are actually hundreds of studies all pointing in the same direction: there’s a strong link between meditation and creativity. Meditation has been practiced for thousands of years and the techniques themselves are fairly simple to master. That’s one of the wonderful things about meditation; it’s easy yet so profound since it can literally change our brain both structurally and functionally thanks to what is called neuroplasticity. Here’s a fascinating study from the NIH describing how one can alter one’s brain using meditation. Such overwhelming scientific evidence hasn’t gone unnoticed by corporations interested in the overall well-being of its employees. Google for example has been promoting meditation for many years because of its many benefits but principally because of what is called: Emotional Intelligence (EI), vs. IQ, EI has been shown to be a great predictor of job performance. 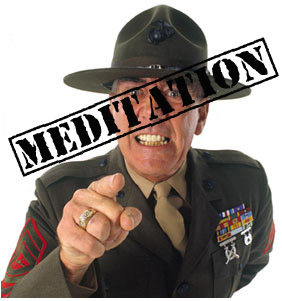 Google is in fact such a believer in the powers of meditation that it has open-sourced its meditation program through the Search Inside Yourself Leadership Institute, so that individuals and corporations can benefit from the techniques of meditation that they have perfected. For more information, I would recommend that you read Google Chade-Meng Tan‘s wonderful book: Search Inside Yourself which advocates Mindfulness Meditation. Some people might be reluctant to start meditation because they find it too “sect-like” or think that it requires them to switch their religious belief system. Nothing could be further from the truth in most cases! The same way one can practice yoga without believing in any of the Hindu gods, meditation and its many benefits can be experienced without any spiritual shift. Now, breathe naturally and bring a very gentle attention to your breath by either focusing on your nostrils, abdomen or the entire body. Be aware of the in breath and out breath and the space in between. Think of this exercise as resting the mind on the breath. You can visualize the breath to be a pillow or a resting place, and let the mind rest on it. Feel free to continue as long as you want or better set a gentle alarm to let you know that the 5 or 10 minutes are over. If you are interested to find out more, I would suggest that you read Search Inside Yourself or Google “meditation” since there are many resources out there. For example, headspace (and its related mobile app) offers a free program to teach you some of the basics in 10 days, 10 minutes a day. Interested in pursuing meditation? Or maybe you already are a avid practitioner? Either way, I would love to hear from you. Please do share your thoughts in the comments section below. 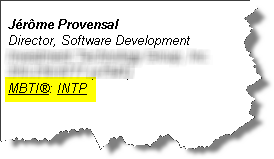 It’s two URLs (highlighted in yellow here) and if you were to click on them you would find out that I’m an INTP-type person according to the well-known and respected Myers-Briggs test (based on the theories of Carl Jung). 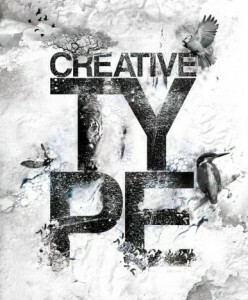 When you understand your type preferences, you can approach your own work in a manner that best suits your style, including how you manage your time, problem solving, best approaches to decision making, and dealing with stress. Knowledge of type can help you deal with the culture of the place you work, the development of new skills, understanding your participation on teams, and coping with change in the workplace. If your work involves selling, knowledge of type can be helpful in understanding what clients need from you, especially how they best like to learn about products and services and how they like to interact during the process of gathering information and making decisions. support many different functions and situations including managing others, development of leadership skills, organizing tasks, creation and management of teams, training for management and staff, conflict resolution, motivation, executive coaching, diversity, recognition and rewards, and change management. The rationale then is still very valid now. The reason I’m bringing this up is that recently while researching my son’s type in order to help find a future college major (he’s 16), I found a website that allows you to take the test, for FREE. I took it and it arrived at the same conclusion that the professional tester did when she administered the test to me…. Minus the $$$ my company spent. I would encourage anyone to take the FREE (yet pretty thorough) test at http://www.mypersonality.info/basic-vs-pro/personality-type-test (it requires you to create a login but they have a “zero spam policy”). If enough people take it and are interested in sharing their test, I think it would be pretty cool to create, in your organization, a wiki/SharePoint page listing everyone and their associated personality type. 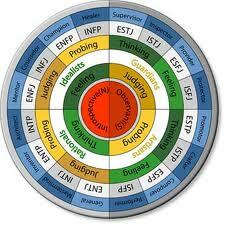 If you end up being INTP, I’m sure that you’ll agree that INTPs rock! Whether you have been thinking about innovation for a while or want to get a good sense of the current playing field in academia, business or non-profit, reading a few good books is a brilliant way to inspire and guide you. Whether you already work for or own a start-up or business, this is a fantastic book. It’s very inspiring and has a ton of great, practical advice to take you to the next step. The book is full of technical tips and information, as well as real-life stories that make the book come alive. The central idea of the book is to develop a MVP (Minimum Viable Product) in order to get feedback from clients as early as possible. The feedback will tell you how to improve the product or “pivot” altogether toward another better/product. There’s a saying telling us that in life there’s no short-cut but this book might prove that is wrong. It’s goal is to attempt to summarize the field of innovation. In this book, the author Scott D. Anthony strikes the right balance between clearly explaining the “state of the union” re: the theory of innovation as far as academia is concerned and his own experiences as an innovator himself and as a teacher on the topic. Armed with wit and a gift for clearly explaining complex topic, the author does a brilliant job at making the discipline of innovation both appealing and inspiring. If you have heard the expression “Disruptive Innovation”, you have to thank Clayton Christensen, the author of this book, for coining it. His seminal work was “The Innovator’s Dilemma” (in 1997) where he set the stage for his Disruptive Innovation theory. This more recent book is a continuation of “The Innovator’s Dilemma” where Christensen offers further thoughts on what make innovations disruptive. Christensen being a Harvard professor, his assertions are backed by plenty of academic references (his own and others’). The key idea is that even if a organization does everything right it will be at risk of attacks from a disruptive innovator with a “game changer” that is simpler, more accessible and more affordable. This book tells how to guard from such attacks and/or become the disruptive innovator. This brilliant book exposes us to the strategies that the world-famous design firm IDEO uses to foster innovative thinking, throughout its organization. Tom Kelley, the founder of IDEO, offers a lot of advice his this book for any organization that is serious about innovation. He masterfully mixes engaging anecdotes and business cases borrowed from his 20+ years of experience managing IDEO. The main idea is that it takes more than one type of person to make innovation happen in an organization: from the Anthropologist—the person who goes into the field to see how customers use and respond to products, to the Caregiver who’s the foundation of human-powered innovation. Of course, one person can be more than one of those 10 faces. The premise behind this engaging book from Peter Sims is that successful, innovative men and organizations became that way by methodically taking small, experimental steps in order to discover, test and develop new ideas. Planning a project around one big idea is risky because it’s almost impossible to determine whether it will succeed as-is. The approach that the author recommends is to make a series of little bets in the general direction of the initial idea. By implementing those bets, one can then learn from small failures or great wins in order to lead the idea/innovation toward an inevitable success. Have you read any of these books? Or do you want to talk about them, please feel free to use the comment section below. Also, do you have one or more favorite books on innovation that is not listed above? Please do share! What do you do when physically aroused? The answer to the question “What do you do when physically aroused?” is that you probably share. By sharing, I mean the stories, news and information that people share with others around them. We forward online articles to our friends, share stories with our co-workers at the water cooler, and pass along rumors to our neighbors. Such social transmission has been going on for thousands of years, and the advent of social technologies like texting, Facebook, and other social media sites has only made it faster and easier to share content with others. But why is certain content shared more than others and what drives people to share? The sharing of stories or information may be driven in part by arousal. When people are physiologically aroused, whether due to emotional stimuli or otherwise, the autonomic nervous is activated, which then boosts social transmission. Simply put, evoking certain emotions can help increase the chance a message is shared. Jonah Berger is also the author of the captivating book Contagious: Why Things Catch On and that’s how I heard of his theory. In both the book and the article he explains how his study was conducted. He and his team of researchers looked at a large number of New York Times articles and whether they made the “most emailed” list, which is a good measurement of the article virality. What they found is that while article evoking positive emotion were typically more viral, some negative emotions like anxiety and anger actually increased transmission while other like sadness decreased it. Berger posits that fear, anger or amusement leads people to share new and information more. These emotions are linked to higher level of arousal and action vs. emotions like sadness or contentment which lead to low arousal and inaction. If something makes you angry (vs. sad) you are more likely to share it with your friends and family because you are “fired up”. With the emergence and the importance of social media these days, companies and organizations must understand why people talk about and share certain things. Berger and his team conducted two experiments to confirm their theory. In one experiment they asked students to watch videos that made them either anxious or amused (high arousal), or sad or content (low arousal). The results demonstrated that students who felt high arousal emotions were much more likely to share with others. In the second experiment, students were asked to sit still or to jog for about a minute – a task proven to increase arousal. Then, they were shown a neutral online new article and told they could email it to anyone. The experiment showed that the students who jogged in place were more likely to share. Why should companies/associations care about that research? People’s behavior is heavily influenced by what others say and do. Whether you are a company trying to get people to talk more about your brand, or a public health organization trying to get people to spread your healthy eating message, these results provide insight into how to design more effective messages and communication strategies. We knew about “don’t drink and drive”, and now we should probably be cognizant of “don’t jog and share”. Forget the elevator pitch! It’s so 20th century. 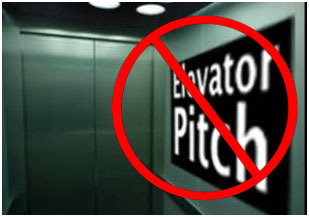 Everybody has heard of the elevator pitch. Dale Carnegie advised us to be ever ready with our “elevator speech” in case we encountered the big boss. Thankfully, companies have become much more democratic and you often have more opportunities to present your ideas to the “suits”. In his new book To Sell Is Human Daniel Pink introduces us to what he calls: the six successors to the elevator pitch. The overall claim of the book is that “selling” is no longer a dirty word or is no longer associated to the repulsive image of a sleazy, shady, slimy used-car salesman. According to Pink, everyone is now in the business of selling or rather living in a world where the skills of convincing or persuading are becoming essential, to everyone. The book’s chapter called “pitch” is particularly compelling and I would like to share with you what resonated with me. 1) the one-word pitch. Inspired by the advertizing agency Saatchi & Saatchi’s “one-word equity“, its claim is that in the 21st century, the attention span is so short that we need the “brutal simplicity of thought”. Think “search” for Google, or Obama’s “forward”. If you can find that one (positive!) word and the world starts associating that word with you or your company, you have it made. 2) the question pitch. Asking your audience a question often packs more punch than your typical declarative statement. Example: Reagan didn’t say “your economic situation has deteriorated over the last 48 months”. Instead he asked the famous question: “Are you better off now than you were 4 years ago?”. Asking a question compels to respond and that in turn provokes a deeper, more intensive processing of the message content. 3) the rhyming pitch. This pitch relies on rhymes which boost what linguists and cognitive scientists call processing fluency. Rhymes “taste good” to our minds and make the content of the message more palatable and more memorable. If you were around during the O.J. Simpson’s trail, I’m sure you’ll remember Johnnie Cochran’s (in? )famous pitch about a certain glove: “if it doesn’t fit… you must acquit!”. So if you want your message to stick, use rhymes. 4) the subject-line pitch. When you think about it, every email message is some kind of pitch, with every subject-lines in your mailbox vying for your attention… “click me!”. According to a study conducted at CMU, email readers based their decision whether to open an email on 2 main factors: utility (it affects your work) or curiosity (curious about what the email is about), where utility taps into extrinsic motivation and curiosity taps into intrinsic motivation. Pink provided 2 examples: the useful “Found the best & cheapest photocopier” and the intriguing “A photocopy breakthrough”. 5) the twitter pitch. Pink uses the example of the investor Stowe Boyd who, while heading to a conference to meet start-up companies, asked the eager entrepreneurs seeking a meeting with him to pitch their idea via Twitter, i.e. in 140 characters or less. Scientists studying the Twitter medium found that the tweets that were the most attention-grabbing asked questions to the followers, proving again the potent nature of the interrogative form (see 2) above) to engage and persuade. Once upon a time, ____________________________________________________________. ____________________________. Because of that, ________________________________. The book then goes on about advice on how to pitch but you will have to buy the book, or ask me to summarize that part in an upcoming post. You now have 6 new ways of pitching. How will you pitch your next idea? Many years ago, I was at a party chitchatting with a young lady, when the inevitable “what do you do for a living” question came up. Her: what do you do for a living? Her: Are you a chef? Her: do you work in the clothing industry? Her: The movie industry?! As a director or writer maybe? Her: alright, I give up. Me: Ok, I’m a software engineer. Me (Trying to ignore her disappointment): Why would you think that I can’t be both a software engineer and also creative?! And this is really what’s at the heart of this post: Can one really be a software engineer and be creative too? Can one really be a software engineer and be creative too? Talking on behalf of my software development brethren, my answer is a resounding, heck yes! Of course, for the uninitiated eye (like the person in the dialog above), software engineering/development might look more clerical than intellectual, and more structured than imaginative. But for anyone who’s worked in the field, it should be apparent that our work is more governed by ideas and possibilities than the monotony and tedium of routine tasks. Surely in recent years, the hundreds of companies and thousands of applications (for iOS/Android) created by software engineers are a very clear and visible testimony that software engineers are a creative bunch. One might say that the coding, the testing, the debugging are probably not what comes at the top of the list of exciting things to do. But can’t they? Who among us never felt the touch of divine inspiration when coming up with a genius way of coding or testing something? That “aha” moment when the idea that makes all the difference comes to you. How about “being in the zone” when the code seems to write itself and designs, made of one clever idea after another, comes alive before your very eyes. As a software engineer, if you don’t feel that you are creative, maybe you never tried to picture yourself as a creative person and maybe it’s time to come out of the “creative closet”. On the other hand, if you feel that you are actually very creative and full of ideas but your creativity and ideas haven’t been acknowledged by your peers, by your boss and by your company in general, then you need to wake them up. I could go on but hopefully you get idea. So, you the teacher, the QA analyst, the engineer, the equity trader, and you who’s always been labeled as “non creative”, do feel that you are the “creative type”? Share you thoughts/frustrations/inspirations in the comment section below.